While reading the review, I saw the comment that a gruff cab-driving turtle, named Kapp'n, asks you a series of questions at the beginning of the game. And, your answers determine what your character will look likein the game AND your gender. I was immediately taken aback. 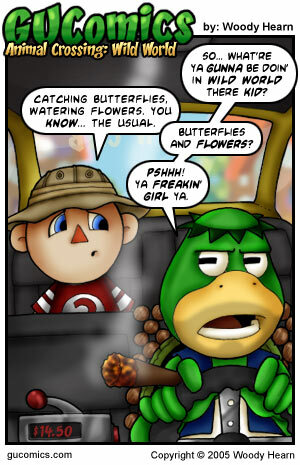 I mean, should a gruff cab-driving turtle really be making my gender decisions for me? Your character is moving to a new town in which you pretty much indenture yourself to a racoon shop keeper who has set you up in a house despite your lack of money. You then proceed to dig up fossils, catch fish, collect bugs, water flowers, etc. to pay off the debt. But, along the way Tom Nook (the slave driving racoon shop keeper) entices you with an endless supply of goodies and upgrades for your house. You know... to keep you on as cheap labor a bit longer as the purchases push you further and further into debt. All in all it sounds like a fun, simple game that I might play on... say... an airplane ride across the country or something. Though, the game would be hard pressed to keep me from playing "Burnout: Revenge" on the PSP or "Zelda: the Minish Cap" on the Gameboy Micro. Besides, I don't have a DS of my own, and I'd feel kinda creepy playing a cutesy game on a Pink DS. My gamer street cred would take a tremendous hit... or something.